Designed for clean, crisp cuts through fabric, these premium fabric shears feature ultra-sharp blades ideal for all-purpose tasks and a unique handle shape for more accurate tabletop cutting. Perfect for a wide range of sewing and quilting tasks, our RazorEdge™ Fabric Shears feature premium-grade, stainless-steel RazorEdge™ blades precision honed to an ultra-sharp edge to make sure every cut is crisp and clean. For mistake-free cutting precision, our unique handle design helps keep fabric flat on the table while you cut. 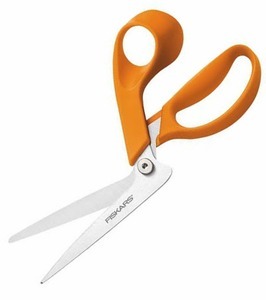 RazorEdge™ Fabric Shears also offer excellent comfort and control thanks to sculpted finger and thumb loops. An advanced pivot design provides ultra-smooth cutting action, and an included sheath helps protect the blades when not in use. Heritage Klein VP4-6" Trapunto Scissor Offset Handle Cut 1-3/8"